1. Mix the cream cheese, 1 tablespoon of the chives, and the lemon juice. Season with salt and pepper. 2. Lay the salmon slices out on a cutting board so that they are all arranged with a short side facing you, with plenty of space above and below each slice. (If necessary, fill and roll the slices in batches). 3. Put a spoonful of the cream cheese mixture on the narrow end of 1 slice. 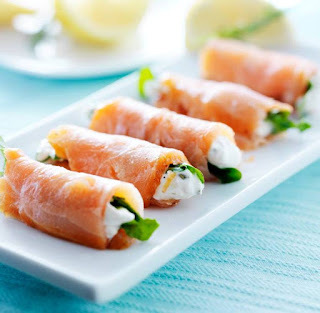 Lay 2 arugula leaves, fanned slightly apart, across the cream cheese, so that the tips of the leaves will project several inches from one end of the roll, and roll up the salmon. Repeat the process with the remaining slices. Cover and refrigerate until serving.